The saying "The whiter the bread the quicker your dead" is a bit tongue and check. However like all sayings it has a grain of truth in that refining destroy's nutrients. Most of us hopefully know that refining slashes the vitamin content. This is because the removal of skin/husks etc is removal of the live part. With grains the starch is covered by the seed coat. It is this seed coat that contains the vitamins essential to the seeds germination. Thus refining removes these vitamins. 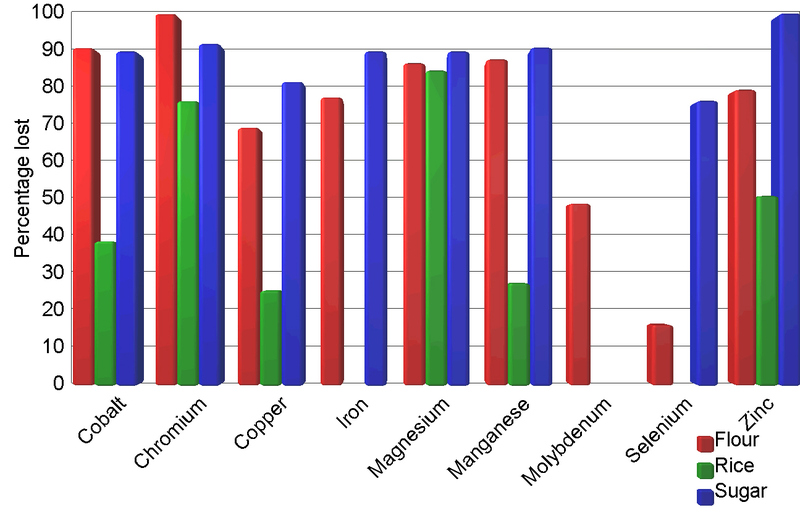 However I had no idea how massively the minerals are reduced. 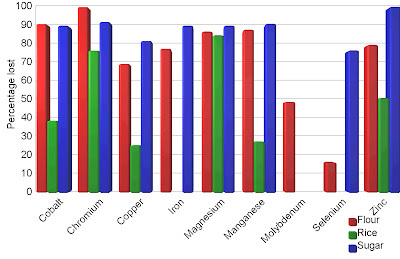 Below is a graph on the reduction in trace elements (trace minerals) when refining occurs. Going from brown flour to white flow, brown rice to white rice and raw cane sugar to white sugar. Guess when this was written ? Here is the link to the 65 web sites. Child obesity - are we part of the problem? Tips for increasing your variety of foods.